Drinking sugared fizzy drinks for just a month changes the body permanently so it’s more difficult to lose weight. The soft drinks don’t just pile on the pounds because of the calories in them – they alter the way your body burns fuel. Your muscles grow to ‘prefer’ sugar to fat as a fuel, and thus losing weight becomes harder. Drinking sugary drinks could be even more harmful than previously thought. Soft drinks alter the way our muscles burn fuel preferring sugar over fat which makes the pounds harder to shift. And worryingly this effect lasts long-term which can raise levels of blood glucose leading to diabetes. 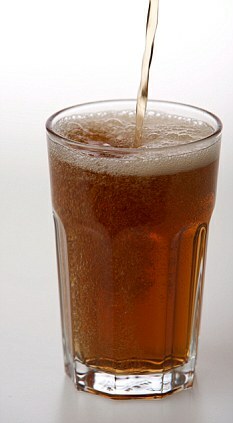 Dr Hans-Peter Kubis, of Bangor University, said: ‘This study proves our concerns over sugary drinks have been correct. ‘Not only can regular sugar intake acutely change our body metabolism; in fact it seems that our muscles are able to sense the sugars and make our metabolism more inefficient, not only in the present but in the future as well. Dr Kubis warned the drinks can compromise long term health and, when in need of refreshment, people should reach for water instead. His researchers also showed isolated muscle cells identify and respond to the sugary diet, and switch how they use the fuel.